Since I probably won't be posting while I'm in Hawaii, I figured I'd leave you with a giveaway. I have 15 packs of Vanilla Bean GU Energy Gel for one lucky runner (or biker or person who just likes using GU for the heck of it). And yes, I am too lazy to take a picture of the GU in question so you get a stock photo. Don't let that fool you though. There are indeed 15 packs of GU waiting for you. The GU is from my own arsenal of energy gels. I bought a 24-pack but realized on my last "long" run that I prefer fruit flavored energy gels. So my changing taste is your good fortune. I'm not going to ask you to visit the GU website because they didn't give me the GU and they aren't giving me any incentive to share it with you. If you want to learn more about GU, Google it. I'll pick a winner on Monday, March 15th. Have a great weekend and week of running! 1. I want the GU because, frankly, I need to figure out something that will work well for me on long runs and at the marathon. The time to figure it out is now! I need it because I'm in the thick of marathon training and GU doesn't send me anything either. Vanilla bean is my flavor and I use GU on every run over 10 miles (pretty much every weekend) so I would love this prize! I'm already a follower; and I absolutely, positively LOVE that GU. It's my favorite flavor. I'm glad you're not giving undo credit to GU, since you paid for your GU! I'll post a link to this on my blog, if I can figure out how! It's a 50-50 chance I will. Vanilla Bean is one of my favorite GU flavors...and you can never have enough GU, right? I'd like it because I'm currently out of Gu and too lazy to go by the store to pick more up :) How's that for honest? Seriously, I love GU and I haven't tried this flavor, but if I don't like it, I have plenty of local running friends who I could pass it on to. i love GU! I am running in a half next month and could surely use some of that guy on my longer runs coming up and on race day!! 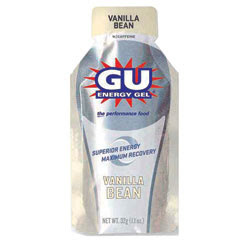 I used vanilla Gu this morning on my tempo run and liked it! I'd love some GU - vanilla is my fave too. Thanks for sharing the gu love. PS - no GU for me. I love vanilla and haven't tried the GU Vanilla Bean!! I would love to try it. I've never tried Gu but I'd like to. Now that I'm running longer, I think I need to. I love vanilla! I've never tried the Vanilla Bean GU, but would love to try it! I would love GUs because I love this flavor and it is the start of race season...that means I need to stock up on GUs!! Vanilla is the only flavor of any gel I can handle and why wouldn't anyone want FREE Gu!!! I want the Gu because Vanilla is my favourite flavour of Hammer Gel, and I haven't actually tried the Gu brand yet. Have fun in Hawaii. I'm super jealous. I love GU. Sometimes if I don't go to the grocery store in a while I eat GU as a snack. So you should help feed me haha! I've never tried GU and would like to! I just became a new follower! Gu is the only fuel type of thing I have used so far in my trainings. I love Gu and always get such an energy burst when I take it. I am training for my first 1/2 in April, and then will begin training for the "BIG" one...a full marathon in October. I can use as much Gu as I can get to get me through these trainings!!! Thanks for the giveaway! I love vanilla gu and am clean out so I would love it! I'm sure you're having a blast and I'm quite jealous! I want the GU because for the first time in my life I am running far enough to need it! I am training for my first half. I want the GU because I'm currently unemployed (read - BROKE) and I start marathon training next week!